The first Canterbury Agricultural and Pastural (A & P) Show, promoted as When the Country Comes to Town, happened in 1862 and, world wars aside, has happened every year since. By far the most popular day of the Show has always been the Friday, originally called People’s Day. Initially, Canterbury Anniversary Day, a statutory holiday, was celebrated on the day in 1850 when the Charlotte Jane and Randolf (two of the four ships carrying our cities official settlers) sailed into Lyttelton Harbour, 16 December. But somewhere between 1955 and 1958 the Christchurch City Council had a bit of a ponder. Having a holiday in December, barely a week before Christmas after which our whole country takes a bit of a breather, was really a tad of a pain. Why not shift the anniversary day to people’s day, call it Show Day and give everyone a day off. Hooray! So, today is Show Day. Currently one of our number is down at the Show grounds hopefully making a bit on the horses and not getting too sunburnt, one of us is at work, one of us is playing with the trains and us three girls are doing what most people not keen on crowds or parting with large wads of cash do on Show Day: tending the garden. Because Show Day also signals the end of frosts. No frosts are allowed after the first Friday after the second Tuesday in November (how Show Day is determined so as to not clash with the Melbourne Cup which is on the first Tuesday, but don’t tell the Australians we kowtow to their event like that); It’s the law. With this in mind, the big happening in the Homestead garden today was cue fanfare: The Grand Unveiling. This crafty contraption has been the cause of a great deal of interest over the last year. Most first time visitors to the Homestead tend to question it’s relevance, usually in a sentence beginning, “What the…. 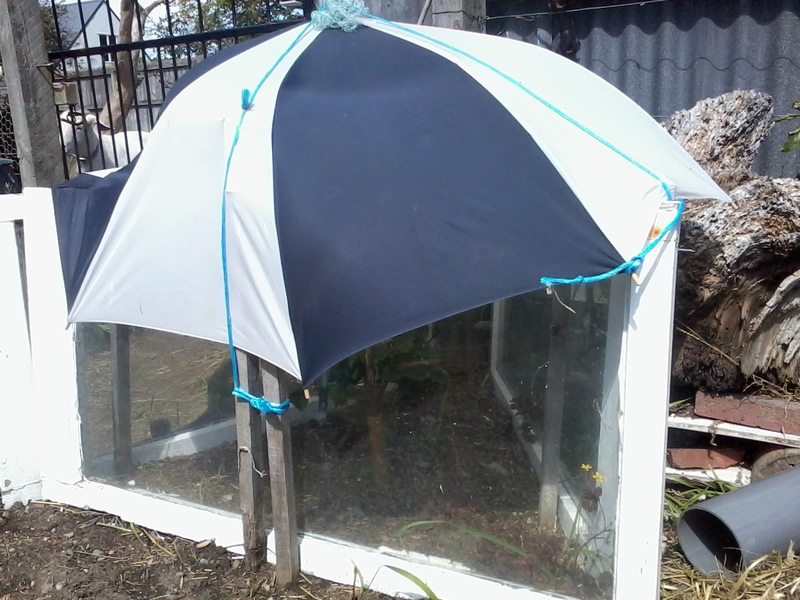 ?” In fact, what it is is the most cunning of plant coddling devices; three windows saved from the Homestead double glazing makeover (perfect for wind protection) with added frost protection of a broken umbrella salvaged from the bus stop. Today the binder twine was reverently unknotted (the easterly demanded quite a few of these, often hurriedly retied in howling gales with the umbrella flapping wildly), the cover was removed with a flourish and the delicate princess that is our lemon tree was exposed to the New Brighton elements. Look at her! All those lovely little blossoms promising (please deity that overlooks these things) at least one, little golden globe of citrus spark and bite. That’s all we ask…well, that’s the absolute minimum we ask…after nursing this, our third attempt to reproduce something that grew like a glossy Goliath outside out kitchen window at the previous Rotorua-based Homestead, through rain, hail, storm, frost, gale and a huge amount of shelter-ridicule. This entry was posted in community, Family, Garden and tagged allotment, Aotearoa, Canterbury Show Day, Canterbury Society of Model and Experimental Engineers, chores, Christchurch, CSMEE, frost, frosts, garden, gardener, gardening, lemon, lemon tree, NaBloPoMo, New Brighton, New Zealand, organic gardening, Otautahi, Permaculture, Races, Show Day, Show Weekend, weather. Bookmark the permalink. Good luck with the lemon tree. I haven’t had one since I lived in Auckland in the 1970s and I still miss it. I wondered what was under there and was pleased to find that the answer was a lemon. After trying a great deal of other options to get our citrus hit, this has (so far) been the best although we have faced a great deal of ridicule in the process. Ok, you know me…I googled the show, and discovered it’s probably an awful lot like the Fall Fair that is my neighbour for three days a year at the beginning of September (Fall), except we don’t have horse racing, which is not big here on the Island. Yours looks like the sort of thing I would definitely spend a day at – not the midway or the fair food, but the rest of it. The thing is, I don’t have to drive or bus to get there, so no parking or traffic worries, and we have membership in the agricultural society that runs the fair, so it is free to get in. If I had to drive any distance to get there I probably wouldn’t bother either – because it WOULD be a bother. Living next to it definitely makes it easier. Now yours had some fun things going on – I would love to watch scurry racing, for example. And the wood chopping competition. I’m less certain about listening to anything with the name “Salmonella Dub” but they seem to be a Big Thing. Goats! All kinds of them… How could you resist? Your lemon tree! It’s lovely! The windows are a brilliant idea. Third time’s the charm, I’m sure. Salmonella Dub seem to be flavour of the month around here at the moment but no one on the Homestead (I’m talking the younger ones who are more informed on these things) would, and I quote, “cross the street to see them”. Thanks for the kind words re: the lemon tree. I so hope you are right. Some premier in the past history of our state (Mr Kennett to name names) canned Show day public holiday for Victoria. It means once the Queen has her unbirthday day off in June, we see nothing until November for Cup day and where we live we are in between Melbourne Cup day and Ballarat Show day (same day as your show day) so it’s a long time without a breather. NICE on the recycled lemon protection. Very nifty and frugal. 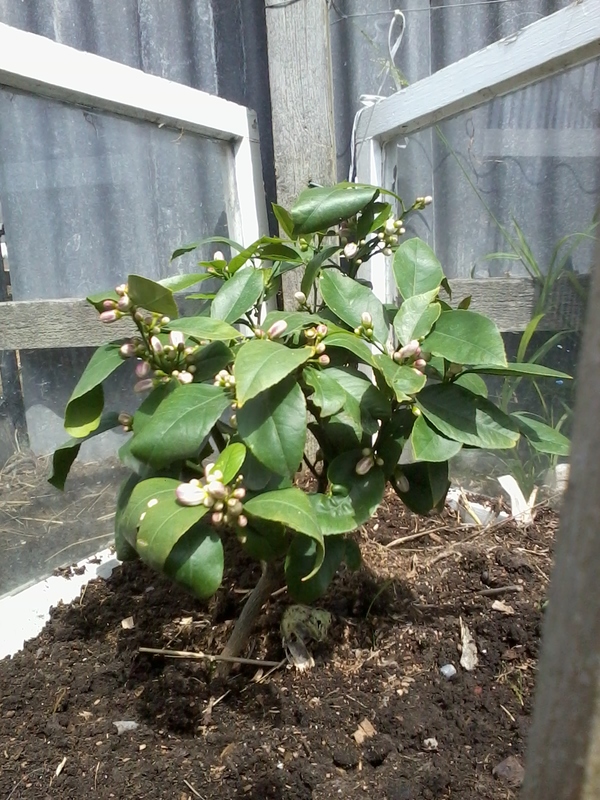 🙂 Ours is growing in the greenhouse although I’ve moved a Cara cara orange tree outside as it’s supposed to be frost tolerant. Time will tell I guess.